Whether your human, fur seal or penguin, parents or caregivers can't help but snap baby pictures. And chances are hundreds of pictures followed those first snapshots, taking up wallspace in frames or memory across your digital devices as the little one grew up. 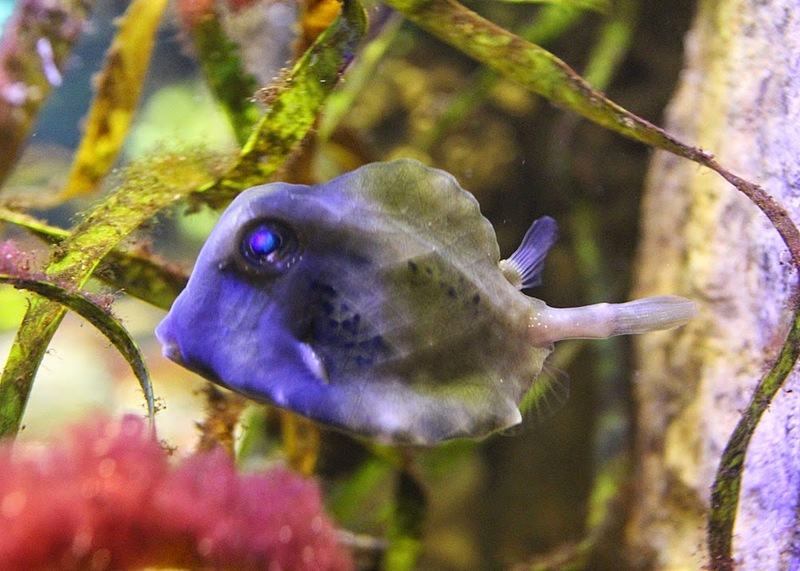 Well, a little trunkfish growing up at the Aquarium right now is no exception. 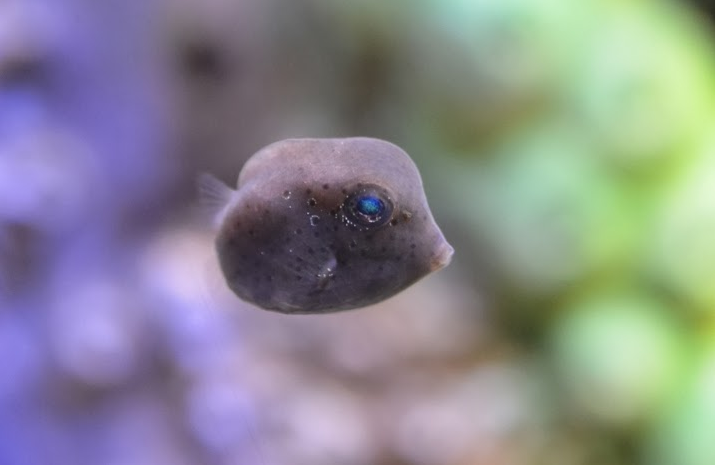 The tiny baby trunkfish was scooped up on a chilly fall day by Aquarium staff during a trip to Rhode Island more than a year ago. A so-called Gulf Stream orphan, the juvenile from the tropics had surfed the Gulf Stream up the coast during warmer months and would have died if it remained in the water over a harsh New England winter. But the aquarists gave this little fish a new lease on life in our comfortable exhibits. ... until finally the little fish graduated to a larger exhibit in the coral reef center, where you can find it today. This fellow has a ways to grow before it can be released into our biggest exhibit, so make your way up to see this little survivor in the garden eel exhibit today. Meet our growing trunkfish! Visit the Aquarium today. Save time and buy your tickets online. This post is part of an occasional series on local marine species compiled by New England Aquarium aquarist Peter Gawne. Unless otherwise noted, all photos are Peter's. When he's not diving locally for these posts or researching coral reefs in Belize, Peter takes care of the touch tank's sharks and rays and the jellies exhibit. Today's post focuses on a local tidepool regular. 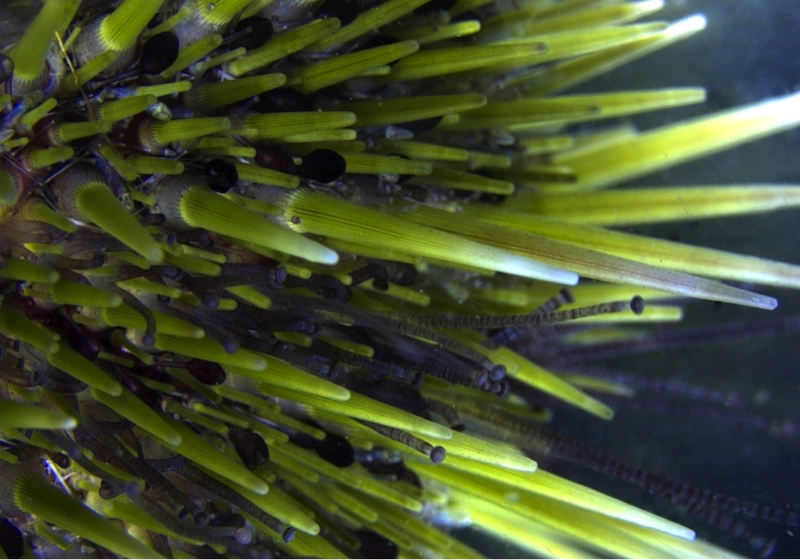 The green sea urchins’ body plan, while typical for their phylum, remains highly unusual when compared to other species in the animal kingdom. Sea urchins have five-fold symmetry, called pentamerism, with five equally sized parts radiating from a central axis. The animal is covered by hundreds of sharp protective spines that are interspersed with projecting suction-cups, called tube feet. To move, sea urchins utilize both their spines and tube feet to pull their body across the sea floor. surface because it contains the mouth. The mouth is centrally located, and has five tooth-like structures, which are comprised of a mosaic of two different kinds of calcite crystals: fibers and curved plates. The crystals are arranged crosswise to one another, and bound together with an incredibly hard cement of calcite nanoparticles. Between the crystals are layers of weaker organic material. These weak spots may allow parts of the teeth to tear away, shedding worn or damaged areas and exposing a new, sharper edge. Sea urchin teeth grow constantly, so this process allows them to consistently have sharp teeth. Many sea urchins bore through rock and other hard substances, so well-honed teeth are essential. Green sea urchin jaws are centrally located in a fleshy mouth, surrounded by short spines and numerous tube feet. Sea urchins use these strong teeth to eat a variety of food sources. 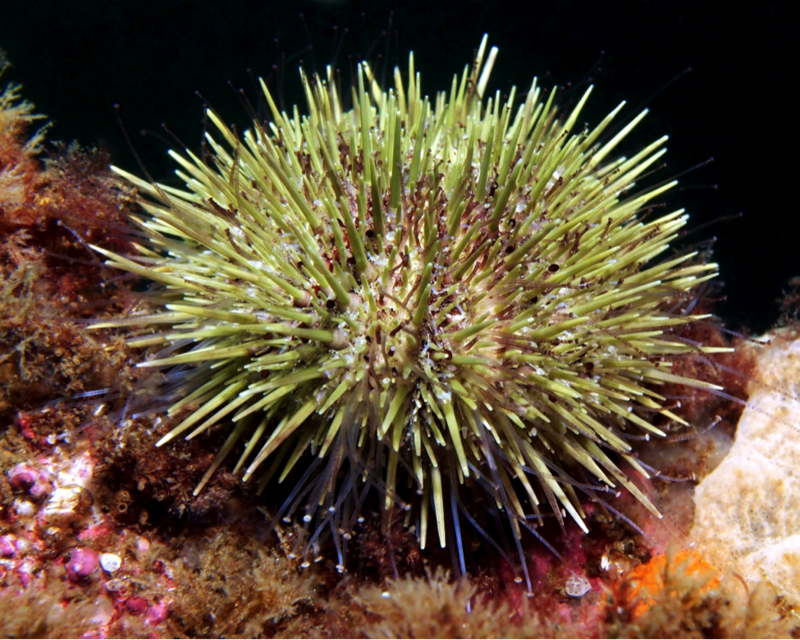 Most sea urchins, green urchin included, are voracious herbivores. Sea urchins in general can be ravenous in their pursuit of plant material for energy. Large aggregations of sea urchins sweep through undersea kelp forests and algae-rich areas, consuming all available material. The urchins’ powerful teeth scrape rock and stone, often removing the very last traces of kelp and algae in the environment, leaving little or nothing to regrow. Such devastated areas are referred to as “urchin barrens” due of the lack of life left in their wake. The sea urchin shell is made of calcium carbonate, and its spherical body is protected by hundreds of spines. Between the spines are tiny suction cups, or tube feet, which are used for locomotion. Sea urchins are eaten by a variety of predators, including sea stars, crabs, fish, mammals, birds, and even humans. Here in New England, Maine’s green sea urchin fishery accounts for roughly 22% of sea urchin landings in the United States. This fishery, while dating back to as early as 1929, really took off in the mid-1970’s to meet the interest from Japanese markets, where sea urchins are prized for their edible gonads. 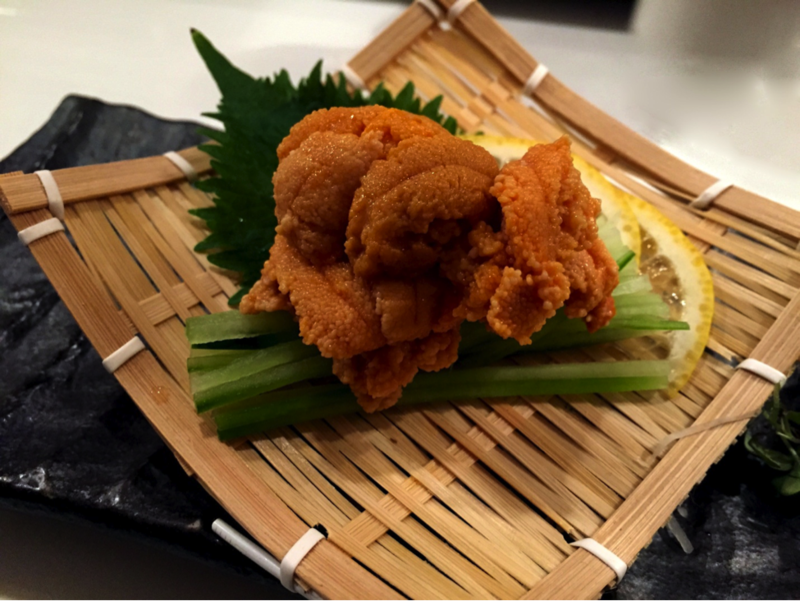 Sea urchin, or uni as it is known in Japanese cuisine, has a unique flavor. It has the consistency of custard cream, and a flavor that is unmistakably from the ocean. Pictured here is a serving of uni offered at a local Cambridge restaurant. Savoring this delicacy is said to induce euphoria as sea urchin roe contains a neurotransmitter called anandamide – a naturally occurring nerve-signaling molecule. The anandamide molecule’s name is derived from the Sanskrit word ananda, meaning “bliss.” This molecule interacts with a receptor that plays a role in controlling pain, mood, appetite, memory, and fertility. Anandamide is very quickly broken down by the body’s enzymes, explaining why it doesn’t produce a perpetual natural high. 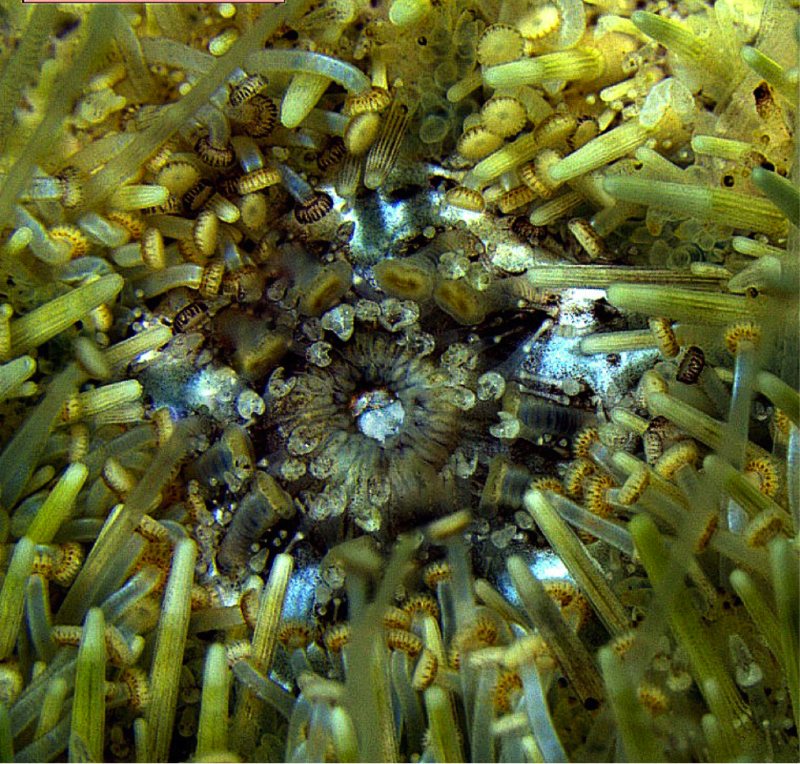 A 2001 assessment judged the stock status of Maine’s green sea urchins to be 90% down from their virgin, unfished biomass. Fortunately, declines in the biomass estimates appear to have slowed in recent years. 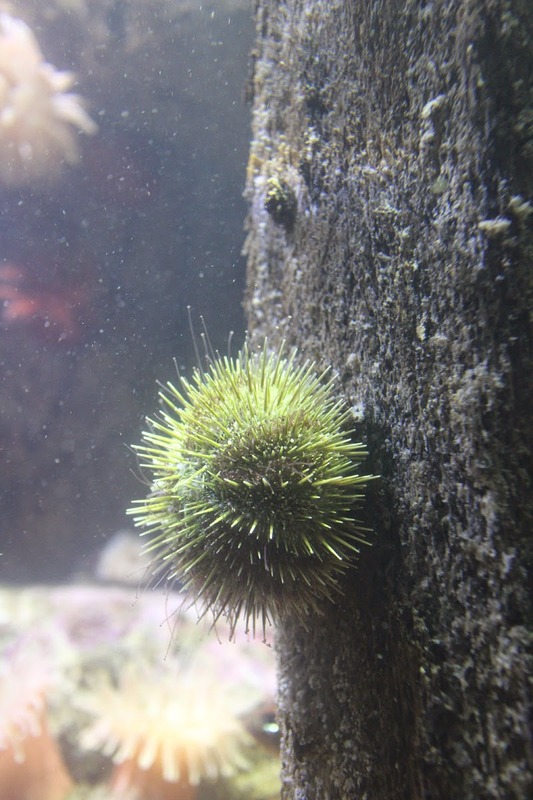 Green sea urchin populations are inherently resilient. Each individual produces several million eggs per spawning event, reaches maturity relatively early—at about 5 years, and may live more than 30 years. Finally, the fishery for green sea urchins is accomplished mostly through hand collection by divers, so depths greater than practical on scuba gear act as a reserve for the urchins. Come to the Aquarium and see these living animals up close, in person! This post is part of an occasional series on local marine species compiled and photographed by New England Aquarium aquarist Peter Gawne. When he's not diving locally for these posts or researching coral reefs in Belize, Peter takes care of the touch tank's sharks and rays and the jellies exhibit. This is part two of a series about mnemiopsis jellies. Read part one first to understand how these jellies are indiscriminate feeding machines. Leidy’s comb jelly feeding efficiency has been on display in the Black Sea since 1982, thousands of miles from their native ecosystem. That's after an unknown ship picked up ballast water containing Leidy’s comb jellies in the western Atlantic Ocean. In order to maintain stability during transit in the open ocean, large ships often carry millions of gallons of ballast water. Upon reaching its destination in the Black Sea the ship dumped this water, therefore unintentionally introducing Leidy’s comb jellies to an area that was not endemic to this species. 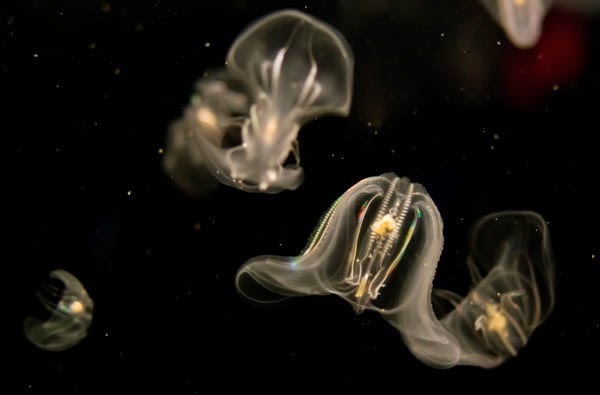 In their native waters of the western Atlantic Ocean Leidy’s comb jelly populations are held in check by a variety of predators, including fish, turtles, sea jellies and other ctenophores. Without natural predators to balance their population in the Black Sea, their numbers soared. 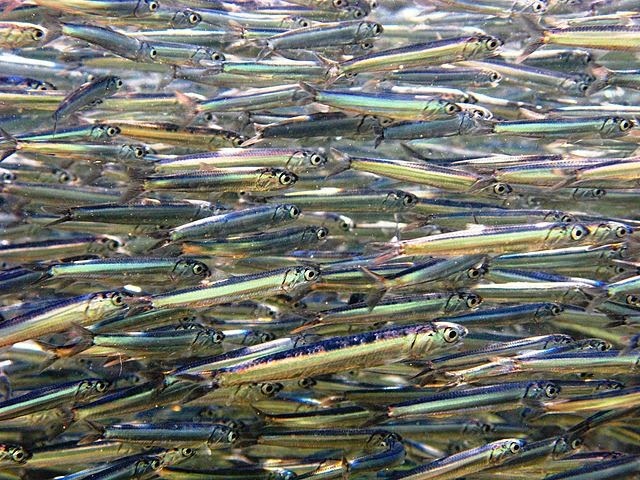 As a consequence, there was a massive decline in the anchovy (Engraulis encrasicolus) population in the region, which was widely blamed on the newcomers. Indeed, the comb jellies’ ability to capture and eat a wide variety of prey launched a twofold attack on the Black Sea anchovy population. First, the comb jellies competed with both adult and larval anchovies for food. Anchovies feed predominantly upon zooplankton, which is also on the menu for comb jellies. Secondly, the comb jellies were able to consume the anchovies’ eggs and larva, driving the population into further distress. As a consequence of this foreign invasion, the anchovy population declined, and the commercial catch plummeted; the Black Sea anchovy catch dropped from over 300,000 tons in 1982, to under 100,000 tons by 1990. 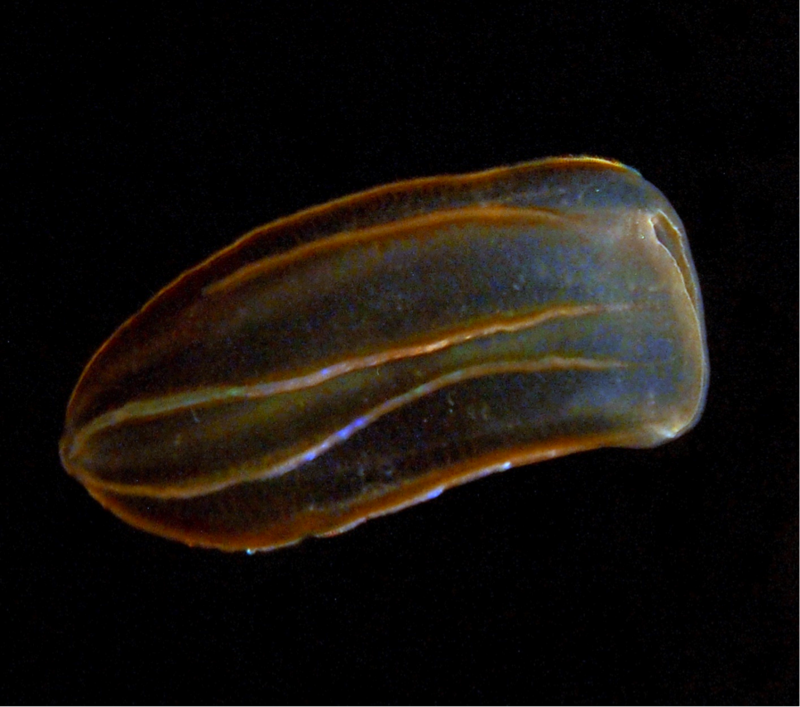 This ctenophore, likely Beroe ovata, resembles a swimming sac. They lack adhesive cells for prey capture, and instead use their forward directed mouth to engulf prey whole (video). They feed voraciously on other comb jellies. The story of these comb jellies continues as a tale of bio-escalation. In 1997, the predatory ctenophore Beroe ovata found its way to the Black Sea. 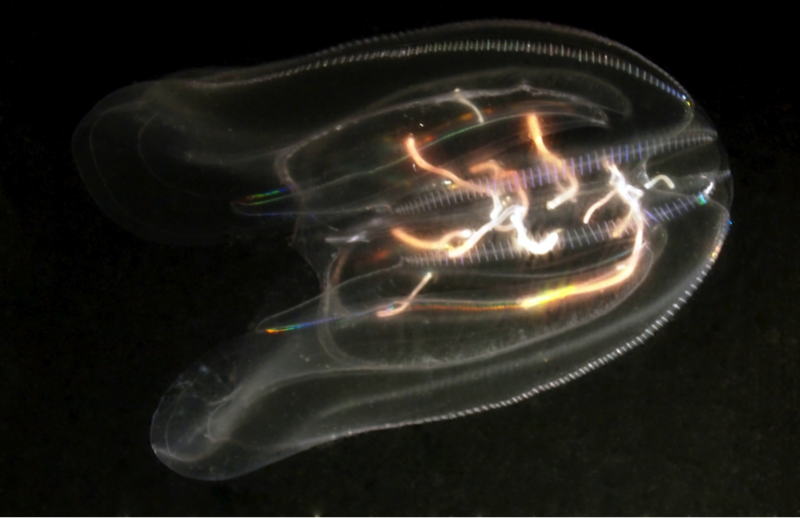 Like Leidy’s comb jelly, B. ovata naturally inhabit the western Atlantic Ocean, and it is likely they were also accidentally introduced through a ship’s ballast water. While Leidy’s comb jelly can feed upon a wide range of prey species, B. ovata are a rare case of very narrow food specialization; their primary food source is Leidy’s comb jelly. Due largely in part to the introduction of B. ovata, Leidy’s comb jelly populations are now reduced in the Black Sea, though they still remain a dominant entity in the pelagic community. Fortunately, Black Sea anchovies have an enormous reproductive potential, and the population is showing signs of recovery. The lines within this Mnemiopsis leidyi are the wormlike larva of the lined anemone (Edwardsia lineata). Their mouths extend into the comb jelly's digestive cavity, robbing it of energy. Being engulfed by predatory B. ovata is not the only concern for Leidy’s comb jellies; in their native waters they are also subject to parasitism. The lined anemone, Edwardsia lineata, resembles most any other anemone in their adult phase. Anemones typically spawn by releasing eggs and sperm that combine to form free-living planulae. These planulae eventually settle onto the ocean floor or other hard surface and metamorphose into adult anemones. In the case of lined anemones, their planulae seek out Leidy’s comb jellys and parasitize them. The planulae dig into the ctenophore and reside in its body wall. Once safely within the ctenophore, they develop long wormlike bodies, and extend their mouths into the comb jelly’s digestive cavity, where they feed off of the food that the ctenophore collects. While not fatal to the ctenophore, the parasites restrict the food intake and energy available to the comb jelly. The larval lined anemones will eventually leave the ctenophore, settling to the ocean floor to become adults. Plus, all these species are on exhibit at the Aquarium! Plan a visit to appreciate these local species. This post is the first of a two-part series about mnemiopsis jellies. Leidy’s comb jellies, like all ctenophores, use rows of cilia for propulsion. These rows of cilia resemble eyelashes or combs. Leidy’s comb jelly belongs to the phylum Ctenophora, and is native to the western Atlantic Ocean. While Leidy’s comb jellies resemble cnidarian jellies, such as moon jellies and Atlantic sea nettles, they are classified as ctenophores and are actually not even closely related. The most distinctive feature of ctenophores is the comb-like arrangement of rows of cilia used for swimming. 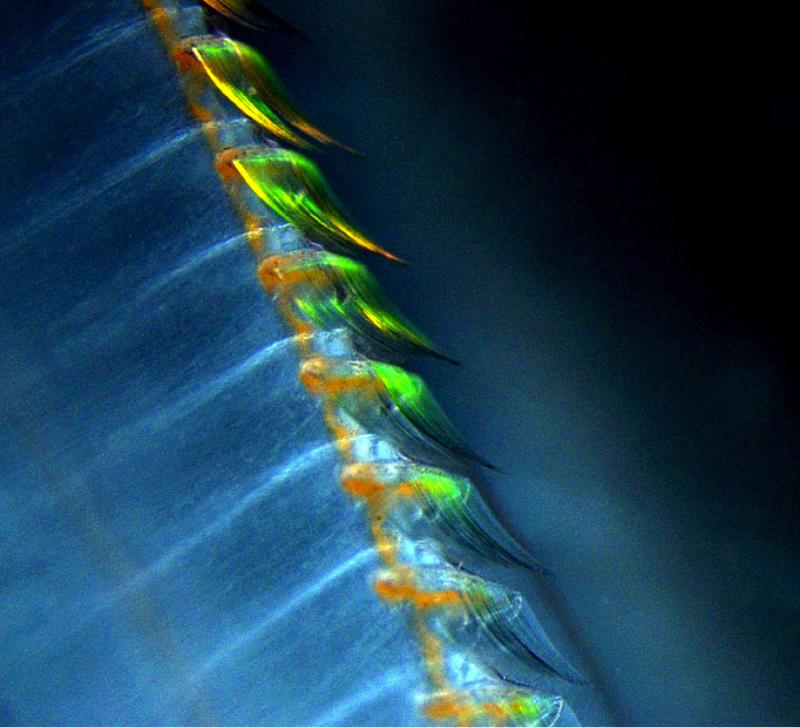 These rows of cilia diffract light, resulting in the appearance of rippling bands across their bodies. While ctenophores are capable of bioluminescence, it should be noted that this phenomenon is merely the result of light scattering off the cilia, and is not light generated by the animal itself. Leidy’s comb jellies are lobed ctenophores, meaning that they possess muscular cuplike extensions of the body on both sides of the mouth. Minute tentacles line the inner surfaces of the lobes. Leidy’s comb jellies are carnivorous and complex predators with a variety of different structures and behavioral patterns, which contribute to their feeding success. They use cilia to create a low-velocity flow, referred to as the auricular flow field, in which small prey species are entrained. Once captured in this flow, the prey are carried past the oral lobes and onto the oral tentacles. Essentially, the comb jelly is filter-feeding small particles from the water column as they are impelled past its feeding surfaces. 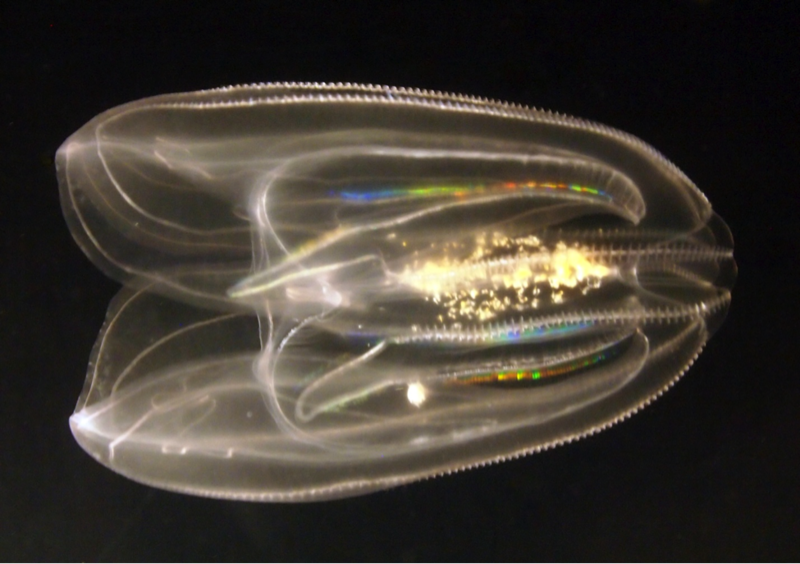 Interestingly, Leidy’s comb jelly has evolved an alternative mechanism for the capture of larger, more motile prey. Larger prey are ambushed by the jelly’s outstretched oral lobes. Prey that are big and strong enough to swim against the auricular flow field are self-propelled against adhesive cells, called colloblasts, lining the oral arms. To capture its prey, Leidy’s comb jellies utilize the colloblast cells located in its tentacles. Much like the nematocysts of cnidarians, these cells contain a coiled filament which uncoils when triggered and impacts the prey. However, the similarities end here – unlike nematocysts, colloblast cells are not venomous, but rather contain granules. Upon contact with the prey, these granules rupture, releasing an adhesive substance which entraps the prey. Unable to escape, prey are transported to ciliated oral grooves, and transferred to the mouth. Colloblast cells are harmless to humans. The most important consequence of the various feeding mechanisms of Leidy comb jellies is the wide variety of prey removed from marine plankton food chains. Leidy’s comb jellies are able to indiscriminately capture a wide spectrum of planktonic prey, both large and small. Tune in for Part Two of this series about comb jellies to learn how these brainless blobs can attack an ecosystem unequipped with natural predators with ruthless precision.